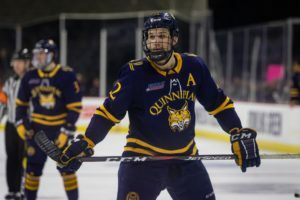 The Quinnipiac men’s ice hockey season came to an end on Sunday, March 31 at the PPL Center in Allentown, Pennsylvania, following a 3-1 loss to Minnesota-Duluth in the Midwest regional finals of the NCAA Tournament. Quinnipiac ends its 2018-19 season with a record of 26-10-2, a fantastic turnaround from last year’s 16-18-4 record. The Bobcats were a win away from going back to their third Frozen Four in seven years, but could not get the win they needed. Minnesota-Duluth controlled the first period, with a sustained offensive forecheck and strong defensive zone play. However, neither goalies would crack and there was no scoring in the opening frame. In the second, an interference penalty to Quinnipiac sophomore forward Odeen Tufto gave Minnesota-Duluth a power play opportunity late in the period. While it could not capitalize on the power play, seconds after Tufto was out of the box, Minnesota-Duluth senior forward Peter Krieger took a feed from sophomore defenseman Scott Perunovich and beat junior goaltender Andrew Shortridge glove side with a shot from the faceoff dot. The Bobcats’ aggression came back to bite them as Minnesota-Duluth took advantage of a pinching defenseman and went down on a 3-on-1 rush. Junior forward Jade Miller made a slick move around a diving senior defenseman Chase Priskie and fed sophomore forward Kobe Roth for the tap-in. The score put the Bulldogs up 2-0 with just over five minutes left in the game. But the Bobcats would not back down. After a delay of game penalty was called on sophomore defenseman Mikey Anderson, senior forward Craig Martin ripped a shot short side on junior goaltender Hunter Shepard to make it a one-goal game with about two minutes to go. However, the comeback was stopped short, as senior forward Parker Mackay picked off a Priskie pass and iced the game with empty-netter. Minnesota-Duluth advances to the Frozen Four to take on Providence in Buffalo, New York on Tuesday, April 11. “[Minnesota-Duluth] was impressive tonight, I like the way they play,” Pecknold said. “They have just a lot of really good players and a lot of guys, maybe six or seven who are going to play in the NHL. They manhandled us tonight. Minnesota-Duluth stymied Quinnipiac offensively for most of the game. Quinnipiac only had 10 shots through the first two periods, but were able to rattle off 11 in the final frame. For the Bobcats, it was the last time the seniors would wear the navy blue and gold. Senior defensemen Luke Shiplo and Brandon Fortunato, senior forward Scott Davidson, Priskie and Martin all will graduate and have competed in their last game at the collegiate level. Davidson, Priskie and Martin sat in the press conference room after the game in nearly full uniform, delaying the inevitable of having to take off the jersey for the last time.